Listen up, ladies! Go-kart racing has been a predominantly male-dominated activity, but it’s time we tell the world about go-karting for girls. Go-karting is fun for everyone, but there are a few things that make it even MORE fun for us women of Autobahn. Read on for the top 3 things that make go-karting so awesome for ladies. The first rule of any bachelorette party? The girls must have more fun than the guys. If your bachelorette party is boring compared to your groom’s bachelor party, you’re doing something wrong. And what better way to make it stand out and fun than with some friendly competition and adrenaline? 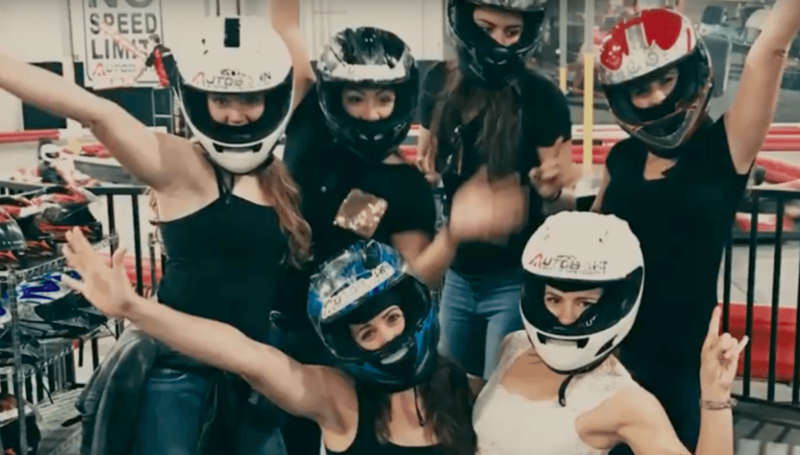 There have been plenty of bachelorette parties held at Autobahn, where you can choose from booking the entire facility and having it all to yourself, or just coming in during regular hours (no reservations required for this option!). Plus, if you’re traveling, we have locations across the U.S. – check them out here. Brides and their parties always have a blast racing against each other and speeding around the track. Any pent-up stress or frustration from wedding planning? This is the perfect place to let it out by zooming around at speeds up to 50 MPH. Wine nights are great and all, but sometimes we need something a little more exciting, right? My friends and I love leaving our guys at home and heading to the track to laugh and race against each other. It’s the perfect way to start the night before heading out for some drinks afterwards, and always leaves us with awesome memories. We even like to make the loser of the night buy the first round of drinks, and sometimes we’ll let the winner choose where we go. Overall, it’s an awesome, unique night out. Oh, and the guys are ALWAYS jealous! If nothing else convinces you, maybe a discount will. Every Friday after 6PM is Ladies’ Night at all of the Autobahn locations! That means ladies save $10 off race packages or $5 off a single race. The deal runs until close, so you can race all night long for a fraction of the price the guys have to pay. It’s always a blast seeing how many ladies turn out for these events on Friday nights, and it’s my personal favorite night to race. It’s time to show the guys what we’re capable of and to take back the track! Who’s with me? Find a location near you, grab your girls, and let’s race!